Rachel Zissimos is a research assistant for national security and defense studies at The Heritage Foundation. 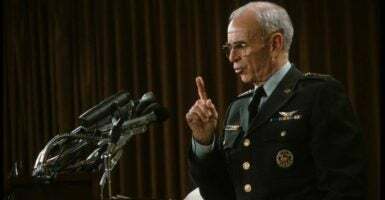 Former Chairman of the Joint Chiefs of Staff, Gen. John W. Vessey Jr., passed away on Thursday evening, leaving behind three children and a legacy of service. Vessey enlisted in the Army National Guard in 1939 when he was only 16 years old ,and over the course of a distinguished 46-year military career, progressed to the rank of a four-star general. Vessey’s early career as a field artillery officer was marked by service in two wars: World War II and Vietnam. His combat experiences were intense. In 1944 Vessey went ashore in the landings at Anzio in Italy, where he was awarded a battlefield commission. Twenty-three years later Vessey was wounded defending a firebase in Vietnam that was in danger of being overrun by the Viet Cong. In March 1982, President Ronald Reagan nominated Vessey to become the next chairman of the Joint Chiefs of Staff. His nomination surprised many at the time as the selection was generally made from among the military service chiefs. Vessey, then Vice Chief of Staff of the Army, validated Reagan’s decision. By the time of his retirement in 1985, Vessey was the longest-serving active duty members of the military. Throughout his service, he never lost his humility. Even after his retirement in 1985, General Vessey continued to serve our country and our troops. At Reagan’s request, Vessey returned to Vietnam to resolve the fate of U.S. service members missing in action and bring peace to their families. The nation lost one of its greatest patriots last week, but we will never forget his legacy and service.